The constant current source or driver is a circuit whose output current remains constant regardless changes in its voltage, or load resistance. The constant current circuits are used in applications such as current limiters, supplying LEDs for illumination applications such as display back-lighting and other current sensitive circuits. The load current is determined by the source voltage and the source’s internal resistance. As such, an ideal constant current source should have infinite internal impedance, which in practice should be very large compared to the load resistance. When the internal resistance is very high, a change in voltage or load resistance will have very little effect on the current. Where, R Load is the load resistance in series with the internal resistance Rg. By having a source with very high internal resistance, the current takes the least resistance path, in this case the load. This ensures that the current flows from the supply into the load and the infinite resistance maintains the current at a constant value, regardless of changes that occur in the load. The infinite resistance is dominant and changes in the load resistance have little effect on the current flowing out of the supply, since it will try to follow the least resistant path which in this case is negligible compared to the infinite resistance. There are different types of circuits that provide constant current. There are passive and active current sources which are either fixed or adjustable. A simple active current source uses a transistor while a passive one uses a resistor. More sophisticated circuits use integrated circuits to provide more stability and control. The output voltage is fixed at 1.5v while the supply voltage to the IC may be as high as 5.5 Volts. The high-side current source supplies the load with a constant current, I = 1.5/ROUT, where ROUT is the output resistance connected across the output and ground terminals of the IC. There are two main reasons for driving certain loads with constant current. To achieve a predictable performance from loads such as matched luminous intensity and chromaticity from light emitting diodes. To remain within the device current ratings limits and ensure reliability, using a constant current avoids exceeding the Absolute Maximum Current Rating. Biasing transistors in amplifier circuits. In measuring instruments such as multimeter/ohmeter when measuring the resistance. 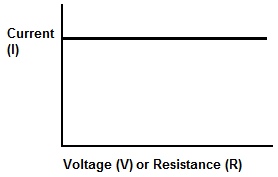 A constant current passes through an unknown resistance and the voltage drop is then used to calculate the resistance. Battery charging: there are types of batteries with a chemistry that requires constant current to charge properly.